C4 Extreme, Pre-workout Supplement, Personal Review! Happy new year to all of you out there! I hope this year brings all good to all of us. As I said earlier, I have been experimenting different diets, supplements and exercises since early 2013. There is no better way to know what’s best for you other than trying, right? Being a group exercise instructor (GXI) means teaching lots of classes. My classes vary in between cardio and resistance training. It is possible to live without pre-workout supplements, yes it is! But let’s face it, on days when I have 5-6 classes where am I supposed to bring energy from? And I’m not big on coffee or energy drinks like Redbull, etc. So I’ve decided to ask my friend, who happens to be an excellent personal trainer, him advice on a good supplement and he said “C4 Extreme, It Is!” and honestly I can’t wait to see him, since I was away during Holidays, to thank him for this great suggestion. 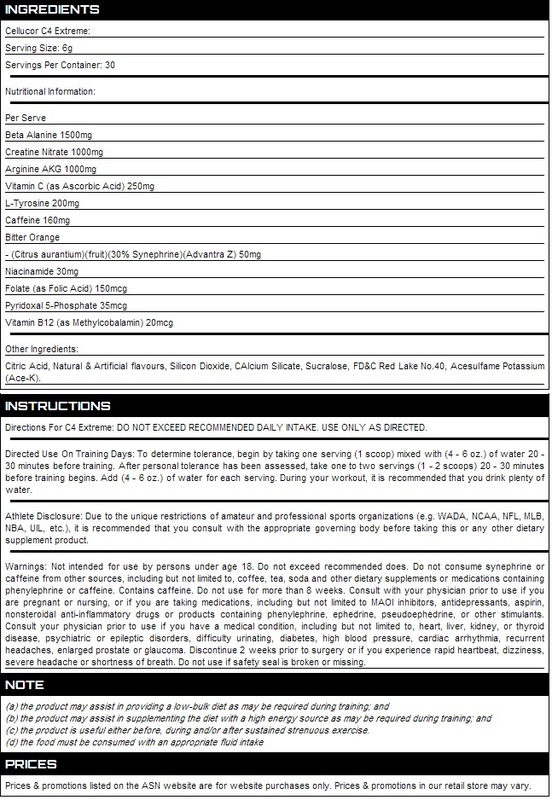 Here I’m attaching for you a picture where you can see facts about C4 Extreme, the product is brought to us by CELLUCOR. This supplement boosts your energy physically and mentally for a long time after taking it. This supplement is made to last in your system for a good while, helping you to finish your workout steadily, It not only amplifies your energy but it also makes you mentally focused and it pumps your muscles in a nice way. When I first took it, I still remember that day, when I was already fatigued and I had two classes back to back(120 minutes) plus I was stubborn enough to think about doing my own weight lifting training afterwards, and I thought to myself: “This thing should work! Other wise I’m dead!” And it did! My body and mind were wide awake, I didn’t feel any sorts of imbalances, as other pre-workout supplements might cause. I was even surprised that not only I didn’t feel fatigued but I also felt powerful and my performance was better than usual. Due to the power I had the members during those classes obviously received some vibes and energy, they all went crazy as we all motivated each other to finish each and every track. I also did my own training later and it all went well. I hear people saying pre-workout supplements cause their hearts to pump too fast and it bothered them. So far I didn’t feel that way, yes it beats faster but It didn’t knock me out, not even close. It takes a few minutes after taking it to feel it, the feeling is describable but it makes you feel ready to crush! NO3 is Nitrate, an advanced compound that promotes unbelievable muscle pumps and amplifies the effectiveness of C4 Extreme. CELLUCOR is utilizing a new compound where NO3 has been fused to create Creatine Nitrate. Increased water solubility promotes better absorption and reduces the chance of the traditional side effects of Creatine supplementation. C4 Extreme has received the highest honors in the supplement industry, including last year’s (2013) Pre-Workout Supplement of the Year and Best Product Innovation from the top retailers in the world, including Bodybuilding.com and GNC. I really don’t usually care much about taste, since first diets make you just eat whatever you have to eat without the need to enjoy your food, second who cares anyway? It’s just a supplement. Do you agree? I don’t think so! some of you want the taste first then everything else! So the one that I have says “Orange” on it, it does taste like many orange juices you get to buy from supermarkets, I think the taste is good, good enough to make someone forget they are taking a supplement. CELLUCOR made sure to make a variety of flavors; Icy Blue Razz, Watermelon and Green Apple, Pink Lemonade, or Pineapple and Orange. So what more could you ask for? I’m personally looking forwards to try the Watermelon and Green apple. I started using C4 Extreme few weeks ago and I don’t take it on daily basis because I don’t want to depend on it. The only thing I noticed, although I’m not pretty sure it is a side effect of C4 Extreme, is some small red spots on my arm right under my shoulder, they don’t look like pimples but rather red spots. It could be something else, it could be an allergic reaction to the supplement. They don’t ache, they don’t itch, so to me whatever. Well, well, well! Excellent is the word to use to rate this! Yes please, before you consider buying one, make sure to consult your physician, because I’m not one. And make sure whatever ingredients this supplement has don’t stimulate or contradict with medications and other supplements you might be taking. Don’t risk your health please. SAFETY FIRST and on top of everything else. If you chose to try this make sure to drink lots and lots of water since it makes you sweat and you need to compensate the loss of water and minerals in your body. Enjoy your workouts, stay fit and fight to be a new you!